The Seven Secrets of Happiness - 10 Minutes of Brilliance: Smart, Funny, Creative and FREE! Today’s blog was supposed to be How to Use your Brain, but somehow it morphed into The Seven Secrets of Happiness. Well, you have to use your brain and heart, your inner heart, to be happy. So, I guess I’m only a little off track. Besides, I think 10 Minutes of Brilliance Readers could use a little happiness. And I know they like secrets because one of my most popular blogs was about the secrets behind logos of famous companies. To understand happiness, it helps to understand why some people are happy and some aren’t. Why are children happy, well, mostly happy? 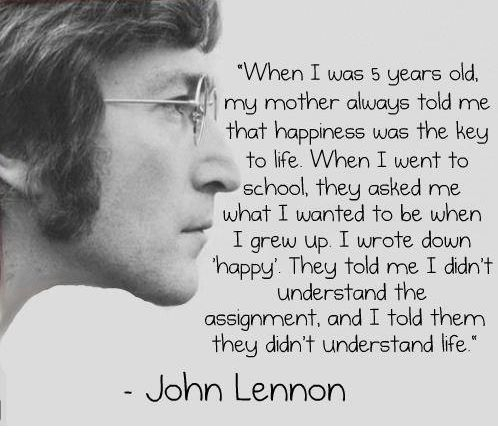 Children are happy because they live in the PRESENTmoment. And living in the present, in the HERE and NOW, is one of the Secrets of Happiness. Children, generally, don't live in the Past or the Future. They live in the NOW and enjoy every moment of it. Well, certainly not every moment. Hell, I had 3 older sisters. Enjoy that! (Writer's Note: They turned out great.) Oh, this is not a photo of me and my real sisters. They each wanted $25,000 and T-shirt rights to be in the blog. For the most part, children are happy. They’re not worried about life, money, food or safety or what might happen in the Future. Children are creatures of the moment and that’s a happy place to live. 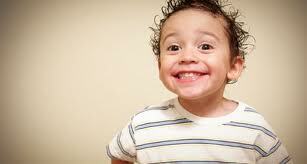 Children who grow up and continue to live in the Present are happy adults. They appreciate what they have, they’re basically satisfied with how their life is turning out. This picture really doesn't relate to anything. I just put it here because it makes what you're reading seem more interesting. Who are the unhappy adults? The ones who live in the Past or the Future. When you constantly look in your rear view mirror at your past troubles or mistakes, fretting over “what might have been,” it’s impossible to appreciate what’s right in front of you. Many Catholics and Jews live in the Past because they carry an inordinate amount of guilt. At least both groups have worked out ways to lessen their guilty feelings. Catholics go to confession. Jews eat cake. In other words, you can’t change the Past, so stop putting so much (negative) energy into it. Similar to people who live in the Past, when you live in the Future and say to yourself, “If only I had this or that, I’d be happy,” you fail to recognize and appreciate what you have now. You’re counting on something in the Future to make you happy. Good luck with that. What happens when you pin your happiness on some event and you finally receive what you’ve been longing for? You’ll probably be happy at first. But it won’t last. It wears off over time and then you’ll be right back where you started, hoping for some Future event to make you happy. Many people think money will buy happiness. It won’t. Sure, having money facilitates things, you can do more, you can have more. But sometimes when you have more, you want more and you’re back in the cycle of living in the future. There’s great example of being satisfied with what you have in the Story, The Banker and The Fisherman, which I told in my blog on the untimely death of the Pillsbury Dough Boy. In the story, the fisherman has found one of the Secrets of Happiness, living a simple life. STAN: He’s right. 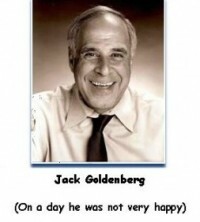 For the first time in his life, Goldenberg’s got it right. HARRIETT: My God, Stan, pigs will fly and Hell just froze over. I’ve never heard you say a kind word about Jack. What was he right about? STAN: He said money won’t buy you happiness. And he was absolutely right. HARRIETT: I’m quite impressed, Stan. That’s a very mature attitude. STAN: Nope, money won’t buy Jack’s Readers happiness. But it will buy mine. Readers should send all their cash to: Stan, The Imaginary Guy on Jack’s Blog, 128 Mackenzie Lane, Denville, NJ, 07834. HARRIETT: Now that’s the greedy ignoramus I’ve always known. HARRIETT: No, Stan you don’t. So if money won’t buy you happiness, how can you achieve peace of mind and contentment? Here’s a clue? It’s definitely not something outside you. Psychologist Abraham Maslow said there were 5 stages of happiness. (Later someone added 3 more stages. Guess he wan’t happy with the original 5.) We try to go through all of these stages, one at a time, and the higher you get on the scale, the happier you are. 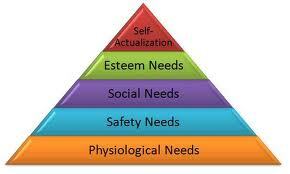 In Maslow’s views, once we attain one level we try to get to the next higher level. The first level deals with our Physiological Needs. These are our most basic needs. It’s hard to be happy when you don’t have food and shelter. Safety Needs help us avoid danger. Master that level and move on up. Social Needs address our connections to others. Esteem Needs involve seeking and gaining approval and recognition. Self-Actualization Needs involve self-fulfillment and realizing one’s potential. This is the TOP prize! You don’t see money or any luxury items on Maslow’s list because money, by itself, will not make you happy. But you couls be happy if you followed the advice of Baba Ram Dass that I mentioned earlier. STAN: Harriett, listen, did you hear that? STAN: Goldberg said he told his Readers about Baba Ram Dass. STAN: So he doesn’t mention Bab Ram Dass until later on in the blog. Don’t you get it? I knew something about the blog that Golberg didn’t know. This proves what I’ve been saying all along! HARRIETT: What? That you’re real and Jack’s imaginary. STAN: Yes! He’s just something I made up. And if I’m real, that means you’re real, too. A big smile comes over Harriett’s face. Still smiling, and shakes her head in disbelief. She can’t believe what she just heard.. Then she laughs almost uncontrollably. HARRIETT: Well, of course, I’m real, Stan! What did you think? I’ve always been real. Jack, too. You’re the one who’s, who’s, well, imaginary. STAN: Oh, no Harriett, you’re imagining things. If you want to know more about happiness, check out an investment book (that’s RIGHT, an investment book) called Beating the Odds by Eddie Brown. It’s an unusual book that will not only make you happier and a better person, it’ll make you a better investor, too. Another great book on happiness is Viktor E Frankl’s Man’s Search for Meaning. Considering that Frankl wrote the book about his life at Auschwitz living in a Nazi concentration camp,it’s quite an achievement that he wrote about happiness. You have nothing to do, but be. (This, by the way, is the underlying principle of metaphysics–the importance of being rather than doing. Hard to understand, until you understand it. Rogé also describes in his book a list a friend sent him about happiness. They could easily be 5 of the Seven Secrets of Happiness. America! What a great country! STAN: Liar! Liar! Goldenberg’s trousers are on fire! STAN: Oh, nothing, really, just caught the no-talent writer in another lie. The blog is called The Seven Secrets of Happiness. But the G-man has gone way beyond 7 Secrets. HARRIETT: And you’re not happy because he gave you too ways to achieve happiness. STAN: Well, I wish there were just one Secret. It would be so much easier to remember if there were just one. HARRIETT: If there were One important Secret of Happiness, don’t you think Jack would have revealed it. Now that I think of it, there is one Secret of Happiness that trumps all the rest. Even if you just understand this one simple fact, you can achieve a happy, successful, fulfilling life. Leave it the mop top boys from Liverpool to reveal the inner Secret of Happiness: All you need is Love. Of course, there are many ways to achieve Love. You should start by loving yourself. Not blind Love. Not Love that overpowers others, but a genuine respect and admiration for yourself. Few people have it. Often something happens in childhood that throws us off our game. So many people have a hidden guilt, shame or lack of self-esteem they don’t share with the world, but it affects their actions, their relationships and ultimately their happiness. We carry so much hidden baggage from childhood that we doubt our own self-worth. We shouldn’t. But once it becomes a habit, it’s tough to change. Love of others can also increase your happiness. When you do a good deed, you just feel better. The Universe is very fair (at times! ): The more you give, the more you get. Love someone else. Love your kids. Love your job. Do something you love. They’ll all make you happy. They’ll all get you there. I get happy when I write my blog because I know some of my Readers appreciate it. I’m happier when I publish because it then I no longer have to continue writing it. Finally, if you’re still unhappy, try this. Make a list of things that make you happy. You can keep it to yourself or leave it as a comment on the blog. Then get busy doinfg one or more of the things that make you Happy. It’s like exercise for your soul that will make you happy. Thanks for stopping by today. Hope you can use some of this loing-winded blog to find a little happiness. Before I go, I’d like to thank the 104 new Readers who’ve joined by blog since I last published. I would also like to thank my two Associate Producers of today’s blog: Tony Witlin for all the great ideas he sends me and Kevin Riley, my new friend at work, an IT whiz and a great guy for some technical help. Happy Trails to you, Readers. Until we meet again. STAN: Happy Trails to you? I know I’ve heard that somewhere before. Who said that? HARRIETT: I think is was Jack. Fireworks, Carnival lights at night, the smell of a campfire, the sound of my daughter laughing, writing letters to my friend from the fourth grade, and listening to Toby Keith’s “God Love Her”. Thanks for this blog Jack. I have a lot to be happy about. I’m blessed for sure. You should write your list. I started thinking about things that make me happy last summer. I put together a bucket list, but I realized many of the things on it needed to be done with someone, and my husband was not really on board. So I thought about a happy list. You’re right, it’s uplifting to think about what makes you happy.